Porcelain Veneers, also called as porcelain laminates or dental veneers, are thin shells of porcelain that are coloured on the front of teeth to create a cosmetic improvement and better appearance. 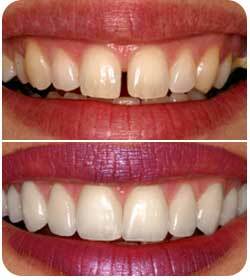 They can make yellow teeth permanently whiter and gray pigmented teeth look much more natural. They also protect the surface of damaged teeth and may eliminate the need for more extensive treatments. 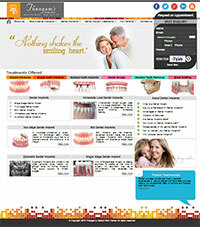 Patient's can look and feel more confident, more professional and have a wonderfully natural looking smile. A mold of your tooth is taken for the fabrication of the porcelain veneers that are constructed for each individual tooth. The custom made veneers are then bound to your teeth with a very strong adhesive. There are a huge variety of adhesives and techniques to using these special dental bonding adhesives. The technique of the dentist is critical at this stage to avoid veneers that fall off (they should not). Dental Bonding is important but the patient should be able to see the veneers in their mouth before they are bonded. The patient may want a whiter color or not like the look of the porcelain. The patient needs to be involved in the quality of care. There are many advantages of getting porcelain veneers. Since porcelain veneers are glass-like in nature (ceramic) they have a great advantage over other cosmetic bonding techniques by way of the fact that they are translucent. When a porcelain veneer is bonded onto a tooth's surface it will closely mimic the light handling characteristics of dental enamel. Porcelain is a ceramic heat fired and does not pick up stains. If there is a stain, it can be polished off easily during a normal cleaning.